There are some things worth celebrating and turning 60 is one of them. That said, what on earth do you buy the person who has everything? And if they don't have everything, what 60th birthday presents can you gift that will make their eyes shine bright? Here are a few ideas that will add joy and meaning to what has already been a rich and full life. If you're keen to show your wife or mother just how special she is, create a photo board with a difference for the big night. 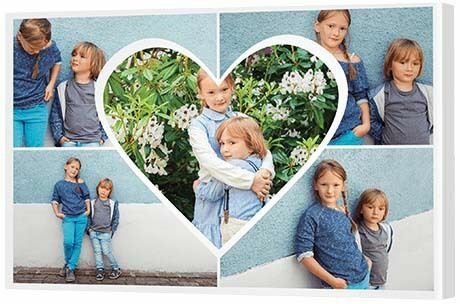 Celebrate in style with a professional photo board you can mount on the 60th party table for the lady of the moment. Gather together new and old photos of major milestones and wonderful adventures. 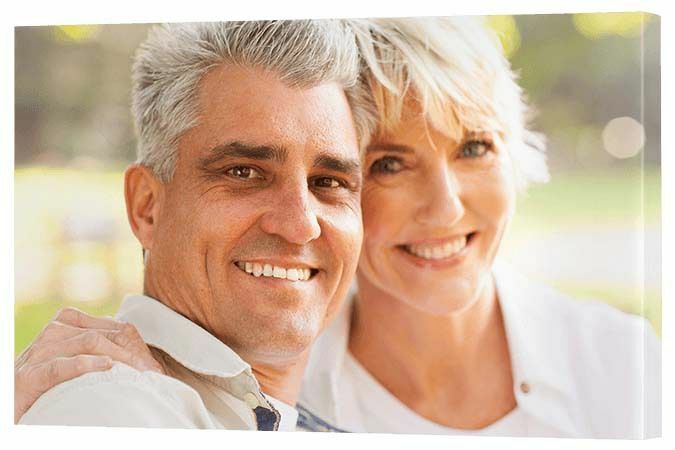 Include a few of the kids, the grandkids and, of course, those important moments she's enjoyed with her husband - getting married, travelling somewhere amazing or simply the happy couple enjoying each other's company. Be sure to dig around the old photo albums and scan in a high resolution copy of the photo. If you're not sure how to do this, ask a family member - someone will be able to help. Once all the photos are digital, create your own balloon collage using this delightful party template from our Silhouette range. The wonderful thing about this gift is that it doubles as a keepsake. After the party, she can find the best place in house to hang it permanently - a treasured reminder of what's important. 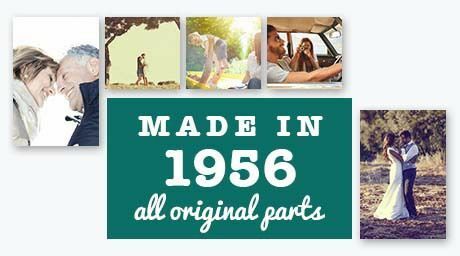 Let's party like it's 1956! Here's another wonderful party photo board, but this time featuring a personalised message for the man who's turning 60. As above, gather together photos from your husband's or father's life. Use our CanvasApp to upload them into the five frames. For the sixth frame, create a fun personalised message to give the print a sense of occasion. If you know a graphic designer, you can ask them to create something for you or you can DIY an image using Canva. Celebrating your mother's 60th birthday is a wonderful opportunity to put the three generations on show. This is a gift that will tug at her heartstrings, but lift her spirits all at the same time. And isn't that what a 60th gift should do? Mum is your rock. She's always there for you and her grandchildren - for chats on the phone, moral support and babysitting duties. This particular gift idea is about that special relationship that the three generations of girls have together. A photo of three generations always makes for a magical moment doesn't it? Well, print that photo to glass and truly celebrate that wonder! That said, you include any photo you like. Been blessed with boys? Include photos of Nanna with her grandsons. A single Dad? Include photos of your strong family unit supporting each other. It's simply about honouring your Mother's role in your life - her strength, her positivity, her grace. Read the words on the themed collage. Let them sink in. She's bound to treasure this 60th birthday gift for many years to come. Turn Dad's favourite hobby into a work of art with a gift that's sure to impress the fisherman in your life. He loves to fish. In fact, it's his favourite thing to do. But that doesn't mean his 60th birthday has to be full of new tackle, new lures or a "I'd rather be fishing" bumper sticker. 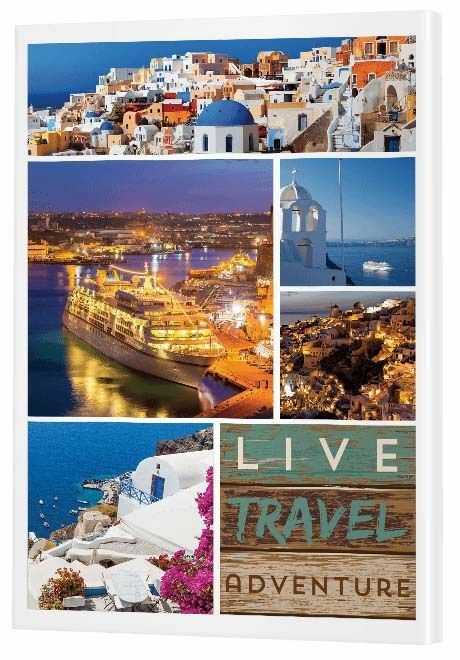 Impress Dad with this amazing split metal print. 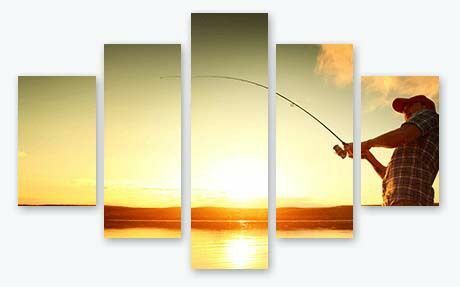 Transform that sunset photo of him fishing on the beach to a stunning work of art. He can hang it in his man cave, sure, but Mum may even let him hang this one in the living room. This present from the grandchildren will not only melt Nanna or Pop's heart, but will add something extra special to their home decor. 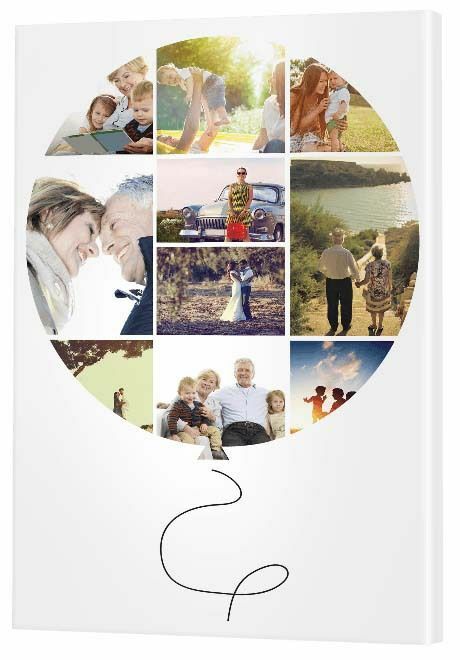 Personalised canvas collages look priceless, but they're actually quite affordable. In fact, this collage - despite having five photo frames - is the same price as a single print. Get the kids together for a photo shoot (professional or DIY) then get them to help lay out the collage online. Our CanvasApp is very easy to use and a lot of fun, so it's a great family craft activity. Most importantly, your Mum and Dad will love it. If his best mate is his dog then this pet collage is one of those 60th birthday present ideas that pays tribute to that relationship. 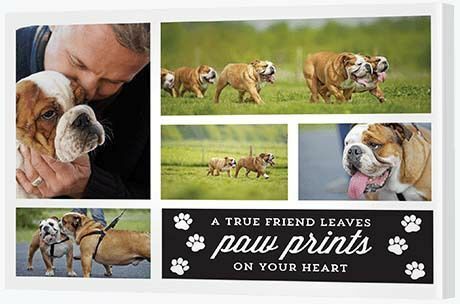 Whether his best mate is still by his side or passed on, this pet themed canvas speaks to the heart of that very special bond. By age 60, animal lovers have often had a number of pets. This collage has five photo frames to fill, so you might even like to put together all the different animal friends he's been blessed with over the years. 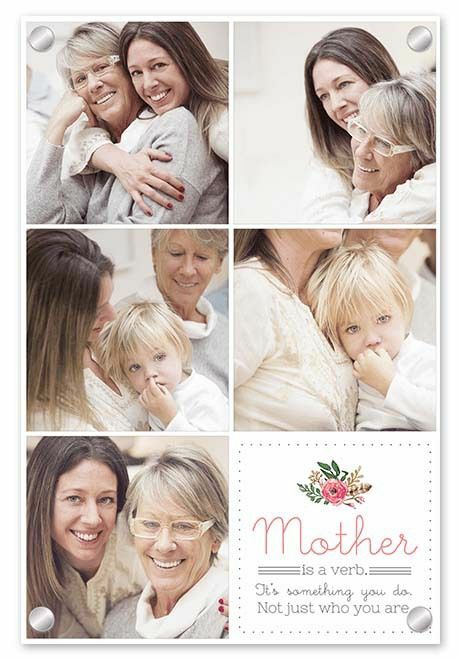 Brighten Mum's world with a beautiful wall art print that will bring a smile to her face, time and time again. It's never too late to get Mum on board with the latest interior design trends. In fact, once you gift her a new art canvas, it's likely she'll be back visiting our site to purchase more. With over 25 million images in the library to choose from, the only problem you'll have is deciding on which one to print! Pattern art has a fabulous way of adding colour and life to a room, making it one of the most fashionable styles in interior design today. Metal art can turn an ordinary photo into something extraordinary. Imagine what it will do to extraordinary photo? You took the leap together to get some couples portraits done. His 60th is a perfect excuse to invest in something special - a brushed aluminium print. There's something about metal that screams 'LUXURY'. It's not only because it's a high quality, robust material but it has a certain style - a je ne sais quois. This gift is for the 60 year old who has travelled extensively and still has the bug - what a wonderful collection of memories. This collage features a generous five frames, so there are two ways you can create this 60th gift. 1. Ask your friend to tell you their favourite trip of all time - and include photos from that trip. 2. Include photos from a number of different trips they've taken. Unless you're the one who's been lucky enough to attend all these wonderful holidays as well, it may take some scheming to get hold of the photos. This example we've put together of a cruise through the Greek Islands is simply magical, but travel photos are some of the most exciting photos in people's albums. So try to rustle through old albums, raid digital photos and scour their Facebook page (if they have one!). Reliving the travel adventures of a lifetime at age 60 is a wonderful reminder that there are many more to come. And with retirement just around the corner, it's just the beginning. Her girlfriends mean the world to her and there's no time they're more needed than when she's turning 60! 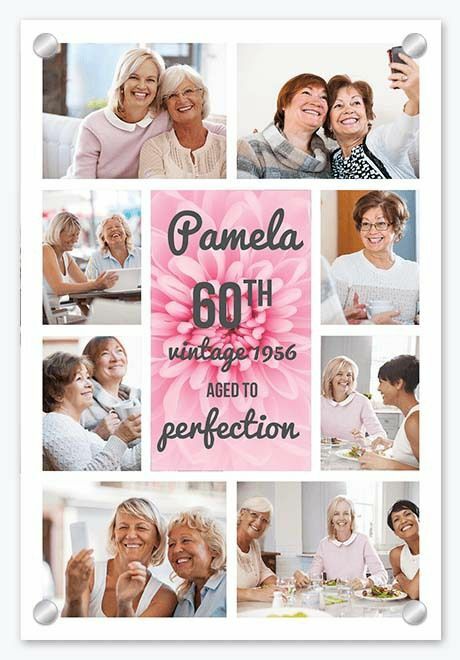 Get the girls together for a 60th gift that honours friendship. Perhaps you're all part of a sewing club, bridge club or book club. No matter, the fact is you've been through everything together - births, deaths, marriages, divorces. You are all the glue. Ask each of her friends to submit a photo that conveys a precious moment spent together with the birthday girl. The trick is to keep it upbeat, so suggest to the group that they use only photos where everyone's having a great time together - think 'big smiles'. Once you've collected all the photos and converted them to digital images, you can start designing your collage. This collage is from our 'traditional' collection, but we've spiced it up with a personalised message in the centre. Love it? You can create your own floral image using Canva, an amazing tool that means anyone can be a graphic designer! 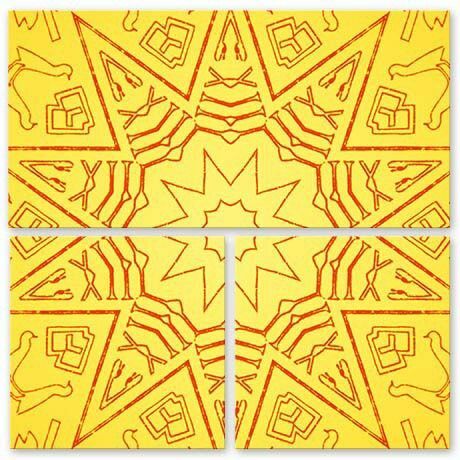 Once you've created that image, download it as 'PDF: For Print' then save it as a JPG or PNG and upload it onto Canvas Factory's Canvas App. 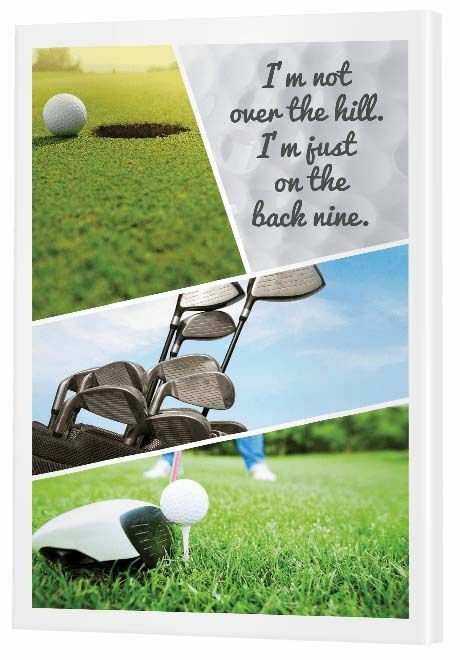 If he loves golf, the opportunity for golf puns is endless, but the idea here is to present his passion as a 60th birthday gift. The four of you - the golf buddies - are inseparable. The only difference between golfing now and back then is that you all much prefer getting around on a golf buggy. If one of you is a hobby photographer (or photo pro! ), take some shots the next time you're out on a golf game. The man of the moment wouldn't have a clue what you're scheming. Place those photos in a modish collage then create your pun using Canva. - It takes a lot of balls to golf like me. - They call it golf because the other four letter words were taken. - My doctor told me to take my iron everyday and to live on greens. - Birthdays are like golf … much more fun if you don’t keep count. - Don’t play too much golf. Two rounds a day are plenty.